Susan Calman has lived to dance another week in Strictly. Despite having a prop dragon custom-made for her Game Of Thrones inspired routine on Saturday, she and dance partner Kevin Clifton could only manage a score of 18 from the judges. Although they came second from last on the leaderboard, they avoided the dance-off on Sunday night's results show, which led to the expulsion of Simon Rimmer and Kevin’s wife Karen. 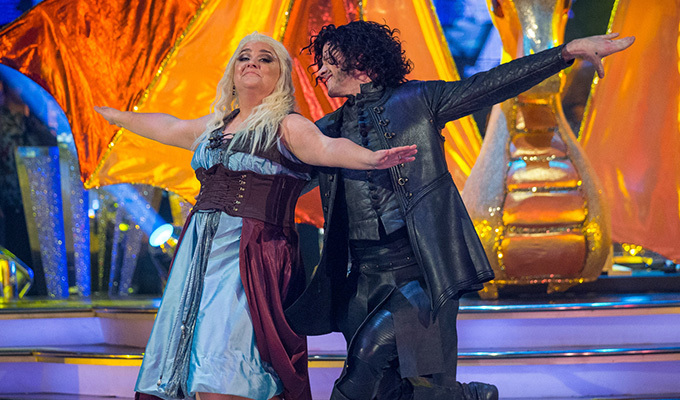 On Saturday, Kevin, who dressed up as Jon Snow, had clashed with judge Shirley Ballas over her criticism. The expert said the routine ‘lacked grace and elegance’. Even Bruno Tonioli, who is usually the most positive of the judges, told the pair their dance was incoherent and featured ‘a lot of mistakes’. Revel Horwood gave the pair just three out of ten for their routine – which had been received well by the audience – the other three judges awarded a five. Calman had dressed as Daenerys Targaryen, Mother of Dragons, for the dance, which they performed to Killer Queen. Before the show, the comedian received a message of support from actress Emilia Clarke, who plays Daenerys in the hit HBO series. She posted a video online saying: ‘Susan, my sources tell me that you are playing the mother of dragons this week on Strictly Come Dancing. ‘As the mother of dragons myself, I wanted to wish you luck because you are my favourite."